Designing new products and improving existing ones is a continual process. Industrial design engineering is an industrial engineering process applied to product designs that are to be manufactured through techniques of production operations. Excellent industrial design engineering programs are essential for the nation’s industry to succeed in selling useful and ecologically justifiable and usable products on a market flooded with goods and services. 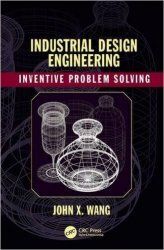 This unique text on industrial design engineering integrates basic knowledge, insight, and working methods from industrial engineering and product design subjects. Industrial Design Engineering: Inventive Problem Solving provides a combination of engineering thinking and design skills that give the researchers, practitioners, and students an excellent foundation for participation in product development projects and techniques for establishing and managing such projects. The design principles are presented around examples related to the designing of products, goods, and services. Case studies are developed around real problems and are based on the customer’s needs. Industrial engineering is a field with a large and extensive presence in our nation's manufacturing and service industries. From this new book, researchers, practitioners, and students will get an easy access to a wide range of effective industrial engineering tools and techniques in a concise format that will provide in-depth coverage emphasizing new thinking paradigms, tools, techniques, and models for industrial engineering problem solving.